This guide will show you step-by-step, how to set up AdWords remarketing lists through Google Analytics. Managing your remarketing lists through Google Analytics (GA) allows you to quickly create and segment lists without having to add additional tags to your site. These remarketing lists can be used for display advertising remarketing, search remarketing (RLSA), and YouTube remarketing. It is recommended that even if remarketing is not a part of the initial marketing strategy, that they are still set up anyway. They do not cost anything to have, and it’s always convenient to have some remarketing lists open in the event you want to activate one. Google’s similar audience targeting is another awesome feature remarketing lists can be used for when trying to better target your advertisements online. You will need admin access to your Google Analytic property and AdWords account with the same login. As a best practice, linking the Analytic property and AdWords account needs to be done from both sides, linking AdWords to Analytics allows your to create remarketing lists from GA, and linking GA to AdWords allows GA user behaviour data (bounce rate, session duration, pages per session, % new sessions) to be added as columns in the AdWords interface. Select the analytic property you would like to link. If you have multiple views setup, you will be able to select specific views to link. Make sure “import site metrics” is selected to add GA data to your AdWords columns. Now we need to setup the link from Google Analytics. 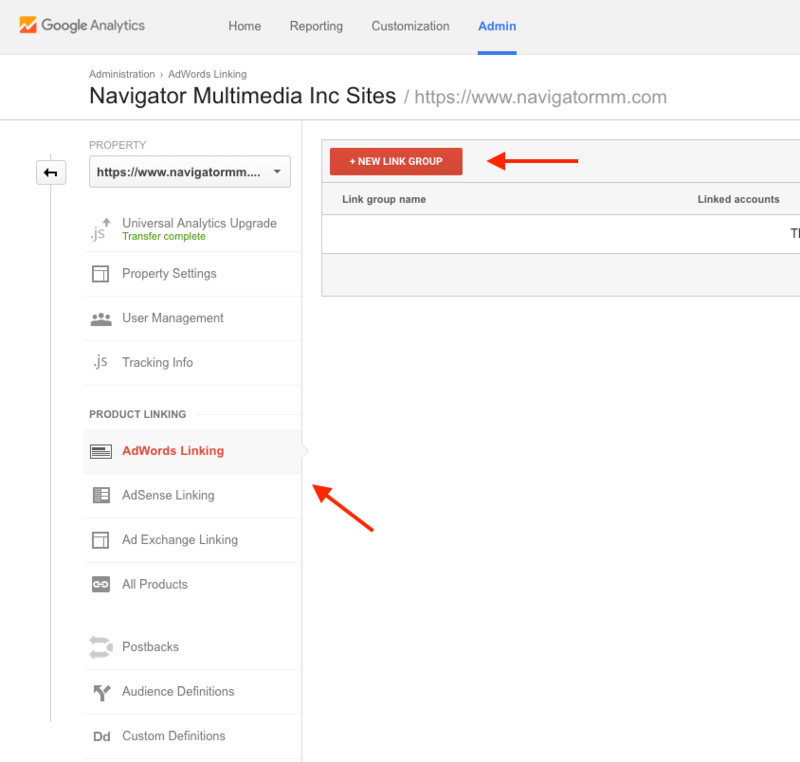 Login to your GA account and under the admin tab, find “AdWords Linking” in the property column. Click “+ New Link Group” to find the AdWords account. Be sure the Client ID (CID) from AdWords matches the account shown in GA.
Once linked, it’s time to open some remarketing lists! 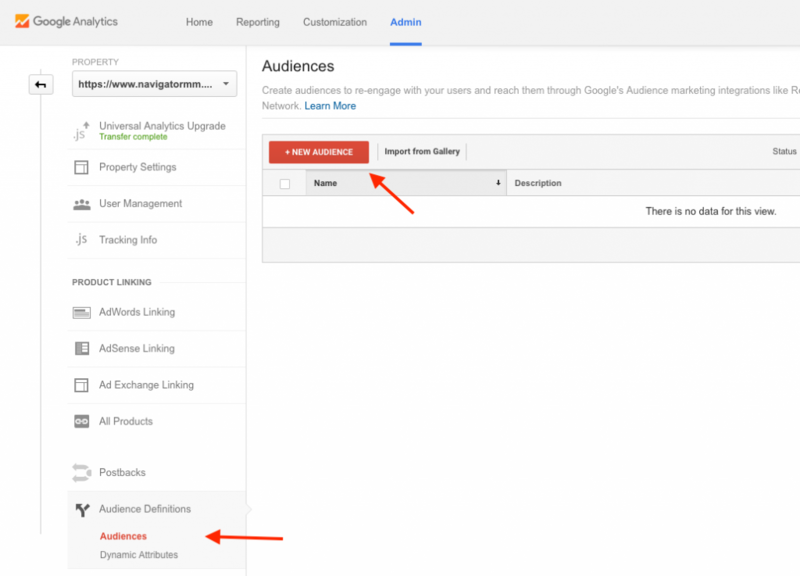 Find “Audience Definitions” under the same column in Analytics and select “Audiences” then “+ New Audience”. Here, you will be able to select your Analytic View, and confirm your AdWords account (CID). Here’s an opportunity to define and build custom audiences. When building out your display ad creative or other media planning, remarketing segmentation allows you to define your audience by demographic, device, and other attributes to improve relevance with your marketing creative. If you’re just getting started, lack conversion data or traffic volume (<5000 sessions /month) it’s best to start with an “All Users” list. List duration can be set between 1-540 days (display). Opening 3-5 lists at different durations (eg: 10/30/90 days) will provide a bit more flexibility when it comes time to using these lists. 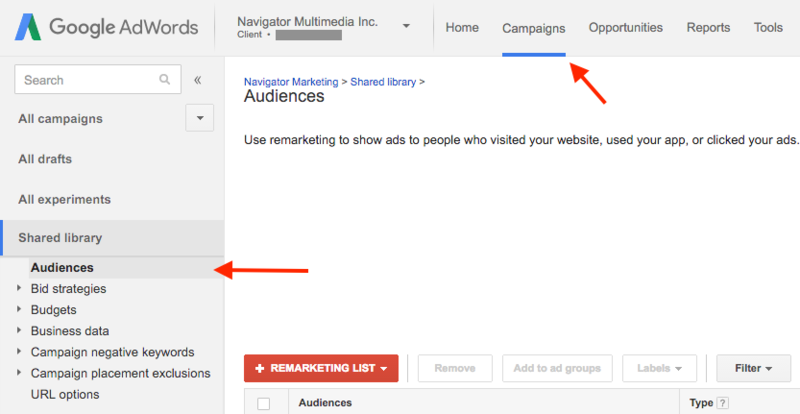 Once you have opened your remarketing lists, head back over to AdWords to confirm setup. Google automatically opens “similar audience” lists allowing you to expand your reach on the Google Display Network. These similar audience lists are built based on user data compiled from your remarketing user profile. Common traits could include age, gender, location, interests, browsing behaviour, etc. That’s it! When it comes to display advertising, targeting an audience who have already shown interest in your product or service is a great place to start. The success from your Adwords remarketing effort comes down to the ad creative, call-to-action, and management of the campaign. We have found remarketing to be powerful addition to many of our ad accounts. Feel free to reach out if you have any questions on this post! You write a good article. It’s help my business. Thank you very much.